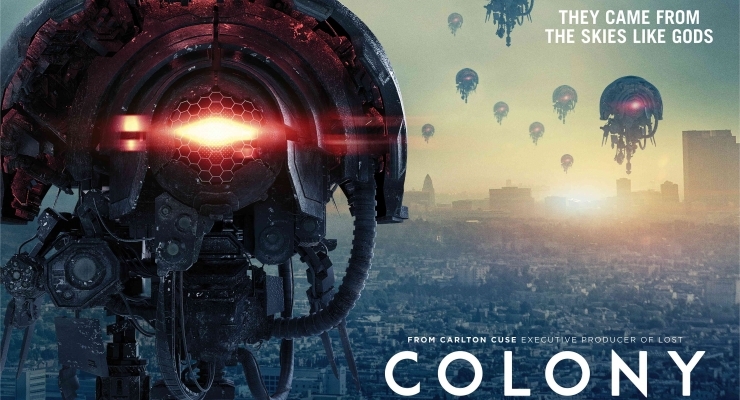 The second season of the USA sci-fi series Colony begins quietly enough during breakfast at the Bowman household: FBI Agent Will (Josh Holloway), Katie (Sarah Wayne Callies), their children Bram (Alex Neustaeder) and Gracie (Isabella Crovetti), Madeline “Maddie” Kenner (Amanda Righetti), Katie’s sister, and her son Hudson (Cooper J. Friedman). As Season 1 ended, viewers wondered who are the “Hosts” or “Raps” (after the Raptor logo on their buildings and uniforms) that have apparently taken over our planet or what are their intentions for the inhabitants of Earth. Katie has been secretly involved with the “Resistance” and one of its operatives Eric Broussard (Tory Kittles) who is now on the run. Will gets a travel pass to Santa Monica and rescues his son Charlie (Jacob Buster) but now Bram has been arrested for breaching the wall and with proxy Nolan Burgess’s (Adrian Pasdar) help, he is sent to a labor camp instead of “The Factory.“ Maddie experiences the mind-control effects of the mysterious “Greatest Day” cult and, with Nolan, she plans to expand its sphere of influence. There is unrest in the Los Angeles bloc and its Chancellor Helena (Ally Walker) pleads her case with the International Authority to spare it from “rendition,” i.e., total destruction. Will returns to his security unit, but finds the suspicious Dan Bennett (Christian Clemenson) now in charge and gets partnered with nasty agent Bob Burke (Toby Huss). Katie tries to get her sister’s assistance with Bram’s release but, when she is rebuffed, she downloads some Authority classified documents from Burgess’s computer. Broussard reconnects with Katie, informs her that he has decoded the pilfered files, and delivers a chilling message: there is a planned program to eliminate all of the inhabitants of the Colony. As the season progresses, former Proxy Alan Snyder (Peter Jacobson) begins to reinsert himself into the political arena of the Occupation and the Hosts. Snyder springs Bram from the labor camp that is subsequently destroyed by the Hosts. Bram is reunited with his family but they are now threatened from all sides as Katie’s role in the Resistance is revealed and Will, having stabbed agent Burke, bolts from his security job to join his wife and her fellow Resistance fighters. Matters heat up considerably when Resistance leader Karen (Laura Innes) launches a major and quite successful attack on the Green Zone, home to the Occupation collaborators. The fate of the Los Angeles bloc hangs in the balance (we do get a very brief glimpse of a downed “Host” being resuscitated) as an exciting and suspenseful Season 2 winds down. Will the LA bloc actually undergo rendition? Will the Bowmans be able to avoid impending doom and make their escape? Will proxy Snyder and Maddie survive? Will the Resistance movement continue? Will we ever get to see some real aliens? There are numerous other unanswered questions and this season’s finale, like its predecessor, is packed with a plethora of plots and subplots that are yet to be resolved. Once again, Colony fans will have to wait for the next season that has already been announced to air in 2018. 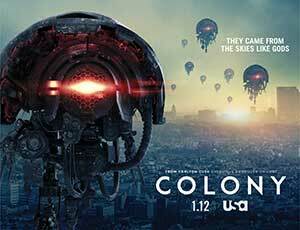 Colony: Season 2 is currently available for streaming through Amazon. Colony: Season 2 picks up where Season 1 left off, as the multi-layered saga of aliens versus humans continues to pour on the drama and suspense.